National Security Archive FOIA lawsuit exposes gap between Obama Administration's "transparency" policies and actual bureaucratic (and judicial) behavior. The U.S. Court of Appeals for the D.C. 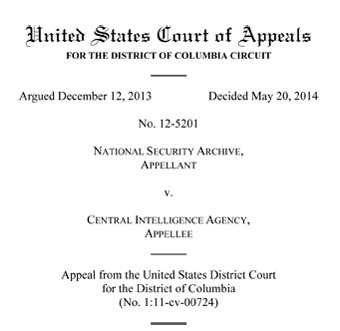 Circuit yesterday joined the CIA’s cover-up of its Bay of Pigs disaster in 1961 by ruling that a 30-year-old volume of the CIA’s draft “official history” could be withheld from the public under the “deliberative process” privilege, even though four of the five volumes have previously been released with no harm either to national security or any government deliberation. “Applied to the contents of the National Archives of the United States, this decision would withdraw from the shelves more than half of what’s there,” Blanton concluded. This language refers to the fifth exemption (known as b-5) in the Freedom of Information Act. The Kavanaugh opinion received its second and majority vote from Reagan appointee Stephen F. Williams, who has senior status on the court. On the 50th anniversary of the Bay of Pigs invasion in 2011, the National Security Archive’s Cuba project director, Peter Kornbluh, requested, through the FOIA, the complete release of “The Official History of the Bay of Pigs Operation” — a massive, five-volume study compiled by a CIA staff historian, Jack Pfeiffer, in the 1970s and early 1980s. Volume III had already been released under the Kennedy Assassination Records Act; and a censored version of Volume IV had been declassified years earlier pursuant to a request by Pfeiffer himself. The Archive’s FOIA request pried loose Volumes I and II of the draft history, along with a less-redacted version of Volume IV, but the CIA refused to release Volume V, so the Archive filed suit under FOIA in 2012, represented by the expert FOIA litigator, David Sobel. In May 2012, U.S. District Judge Gladys Kessler held that Volume V was covered by the deliberative process privilege, and refused to order any segregation of “non-deliberative” material, as required by FOIA. The Archive appealed the lower court’s decision, and with representation from the distinguished firm of Skadden Arps Meagher Slate & Flom, brought the case to the D.C. Circuit, with oral argument in December 2013. The National Coalition for History, including the American Historical Association and other historical and archival professional organizations, joined the case with anamicus curiae brief authored by the Jones Day law firm arguing for release of the volume. 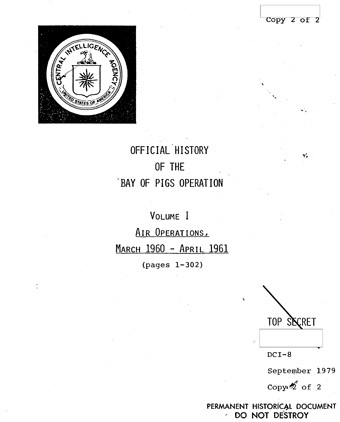 Titled “CIA’s Internal Investigation of the Bay of Pigs Operation,” Volume V apparently contains Pfeiffer’s aggressive defense of the CIA against a hard-hitting 1961 internal review, written by the agency’s own Inspector General, which held the CIA singularly responsible for the poor assumptions, faulty planning and incompetence that led to the quick defeat of the paramilitary exile brigade by Fidel Castro’s military at the Bahia de Cochinos between April 17 and April 20, 1961. The Archive obtained under FOIA and published the IG Report in 1998. The CIA has admitted in court papers that the Pfeiffer study contains “a polemic of recriminations against CIA officers who later criticized the operation,” as well as against other Kennedy administration officials who Pfeiffer contended were responsible for this foreign policy disaster. In the dissenting opinion from the D.C. Circuit’s 2-1 decision yesterday, Judge Judith Rogers (appointed by Bill Clinton) identified multiple contradictions in the CIA’s legal arguments. Judge Rogers pointed out that the CIA had failed to justify why release of Volume V would “lead to public confusion” when CIA had already released Volumes I-IV. She noted that neither the CIA nor the majority court opinion had explained “why release of the draft of Volume V ‘would expose an agency’s decision making process,'” and discourage future internal deliberations within the CIA’s historical office any more than release of the previous four volumes had done. Prior to yesterday’s decision, the Obama administration had bragged that reducing the government’s invocation of the b-5 exemption was proof of the impact of the President’s Day One commitment to a “presumption of disclosure.” Instead, the bureaucracy has actually increased in the last two years its use of the b-5 exemption, which current White House counselor John Podesta once characterized as the “withhold if you want to” exemption. The majority opinion also left two openings for transparency advocates. It invites Congress to set a time limit for applying the b-5 exemption, as Congress has done in the Presidential Records Act. Second, it concludes that any “factual material” contained in the draft should be reachable through Freedom of Information requests.